You know the drill - grab a button, confess, and link on up! 1. I love dark chocolate peanut butter cups from Trader Joe's. They are soooo good. They're a little pricey ($4.29 for a box of about 30), but soooo worth it. 2. I get way too into Husker football. Mike had to tell me to quit screaming at least five times. I jump off the couch, I hit things, I yell, and, yes - last night I almost cried (secret: I've definitely cried before) and may have turned off the TV and stormed out of the room during the fourth quarter. It's a freakin' circus. 3. I've been avoiding the computer. I've been really scatter-brained lately, and I've had absolutely NOTHING to blog about. No one told me that my life would be the most boring thing ever once I got a full-time job. I think I'm the most boring blogger on the planet right now. Oh, well. 4. I'm really excited that this weekend is General conference. For those of you that don't know what that is, you can go here to learn about it/ watch it. I'm not only excited for it because it's amazing, but I'm excited because it means that I get to sleep in on Sunday. Win-win situation. 5. I miss Germany. Specifically the food. And the drinks. Like banana milk and real good bratwurst. Not together - that's gross. I'd probably give a kidney for each of those, though! 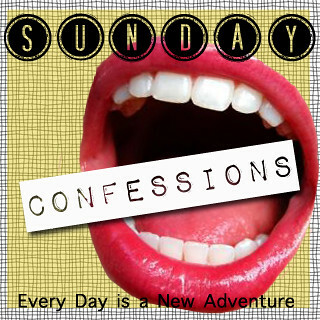 What do you have to confess this week? I too struggle to find things to write about when I am working full time- thankfully holidays make up for it and I suddenly have a wealth of things to blog about! You are never boring Alyx! Enjoy the rest of your weekend! Banana milk?!? Wow, I'd be interested to try that... And dark chocolate peanut butter cups? YUM! I want to try those peanut butter cups now! YUM!!! If it's General Conference time, doesn't that mean we're supposed to set our clocks back an hour? Are we still doing that in the US? I doubt you have the most boring job! lol. I agree though, is very hard to find time/things to blog about when working full time. Actually I think I am the most boring blogger ever right now. So boring that I can't even muster up a post to bore my readers with. That also might make me the worst blogger. All well. I always feel like I'm the most boring blogger on earth when I work a lot. ive felt the same way about blogging lately... when i have the time, i only feel like napping or relaxing... not cranking a blot post out. I presume you're a Nebraska fan, in which case I will keep my Ohio State fan mouth shut ;) and I too am in a bit of a blogging rut. But no worries, the loyal readers always understand, mainly because we all experience it. Have a great week! It's okay. We can tie for most boring blogger award. I know how you feel about not spending much time on the computer. I officially ran out of scheduled posts last week. I got a little scared when I realized that meant I was actually going to have to write something up for this week. I have NOTHING to talk about. Do you think you could make your own banana milk? I don't even know what that is, but maybe it's worth a try? I confess I just at my boyfriend's donut, oops! Oh I've been the worst blogger EVER! Nothing to blog about and I haven't had time to comment on other blogs :( But I'm trying to be better! Conference was so good this year, of course! ANd I always have trouble figuring out what to write. Always. I want some T.J. PB cups, now. And a real Germany bratwurst sounds delish! I'll have to come back and steal a look at all the confessions, or maybe write some of my own! There are shower filters on zohosites.com/ the marketplace to filter virtually every design Title of the shower head and also they are offered in most locations Best Miter Saw Reviews- A Real Man’s Miter Saw where you find shower. lightweight corded electric kinja.com makers for city occupants, to behemoth gas blowers for Title those with large spreads in the snow belt.The big advantage The Top Best Snow Blowers Of 2017 - 2016 that cordless snow blowers like.